With Social Posts, Rival IQ gives you the answers to your data-driven questions and lets you search and find information until you get the perfect result. Then, export or schedule this result to share with your team on a one-time or regular basis. 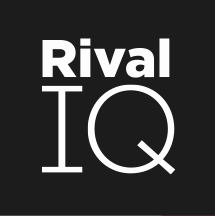 Rival IQ indexes every single post made by your companies across all channels to deliver a comprehensive view at a glance of your content landscape. Using the search capability, you can filter the results you see to show instantly for set of posts having a keyword or hashtag. Note: this capability does not search the entire internet, and shows only the set of posts matching either an empty search or a specific search for the companies in a Rival IQ landscape for the date range specified in Rival IQ. For the Rival IQ landscape depicted in the image above, you're seeing the results for 672 individual posts. 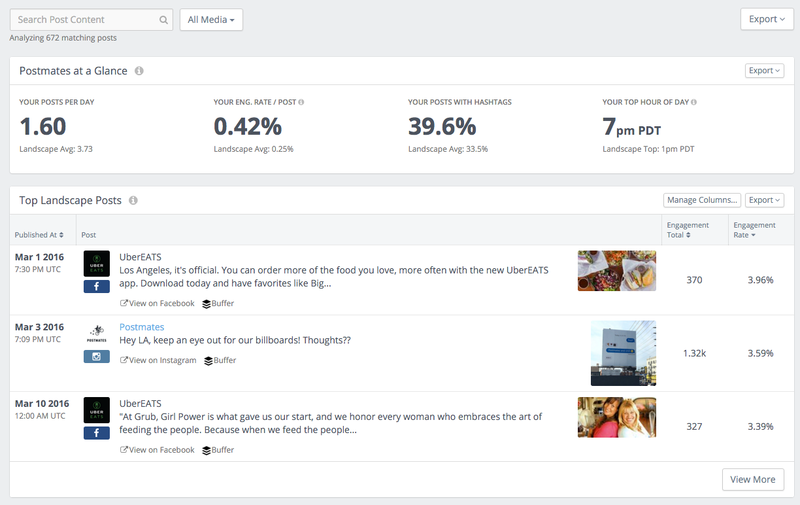 This section of the Social Posts page gives you key metrics for your company. We calculate the number of posts per day your company has posted (in the illustration we are listing all posts cross-channel, and you are also able to show a single channel); the average engagement rate you have achieved in a your posts; the percentage of your posts containing a hashtag, and the top hour of the day for engagement (related the hour when your posts were made). Below each one of these statistics we list the corresponding average for the landscape. The Top Landscape Posts list the top few posts in your landscape for the time period, sorted by engagement rate. You may choose to add different columns to the display or to sort by different column headers. Here is an example displaying columns you may add to the Cross-Channel view; this will look slightly different contingent upon the channel you pick. To see additional posts in your landscape during the period you have selected, click View More to see a table of posts. You may also filter these posts with a hashtag or keyword, as in the illustration below. Exact search - use quotation marks to set off an exact search, e.g. "diamond ring" to search for the compound term diamond ring. Logic AND - multiple keyword searches are treated as AND automatically. You can use the word AND to make your search more clear to yourself, but it is implicit in your search by default. Please note that you need to type the term AND in all caps. Logic OR - Use the term OR searches for one term or another (e.g. diamond OR ring searches for posts made by the companies having diamond or ring). Please note that you need to type the term OR in all caps. Logic NOT - Look for posts that exclude a term using the term NOT (e.g. diamond NOT ring will show you posts containing the word diamond and excluding the word ring. Please note that you need to type the term NOT in all caps. Hashtag search - to search for a specific hashtag, search for that term using a number sign, e.g. #diamond to search for the hashtag #diamond. Of course, you can combine other operators along with the hashtag search. E.g., to find all posts that contain hashtag #running or #2017, search #running OR #2017. Wildcard search - To find all posts that contain words whose beginnings match a set of characters, use the wildcard symbol *. E.g., to find all posts that contain any word starting with win-, search win*. 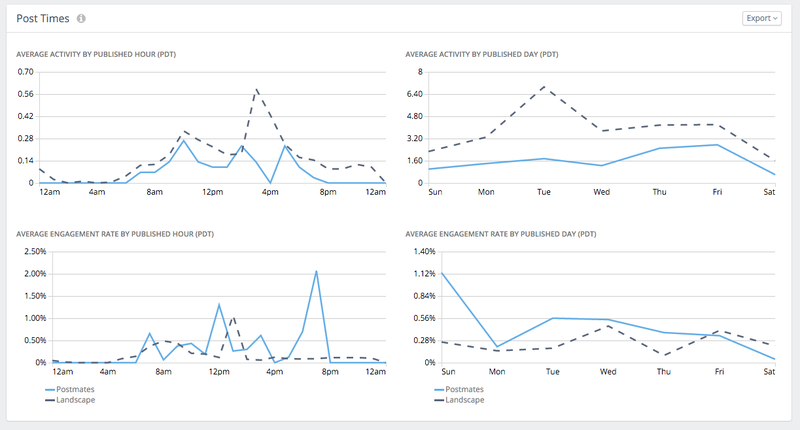 Rival IQ also helps you track the Activity and Engagement for all of the companies in your landscape. 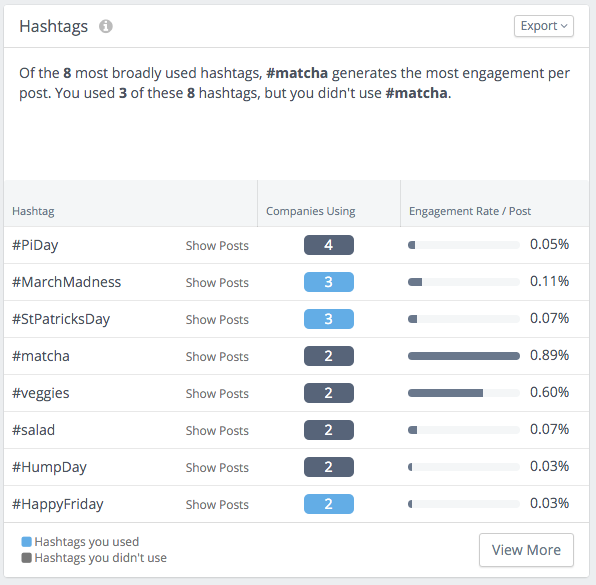 The Hashtag panel shows you the most effective Hashtags used in posts by companies in this landscape, and also reveals Hashtags used by companies in your landscape that you did not use. Using View More gives you an expanded list of the companies and which Hashtag was used by which company. 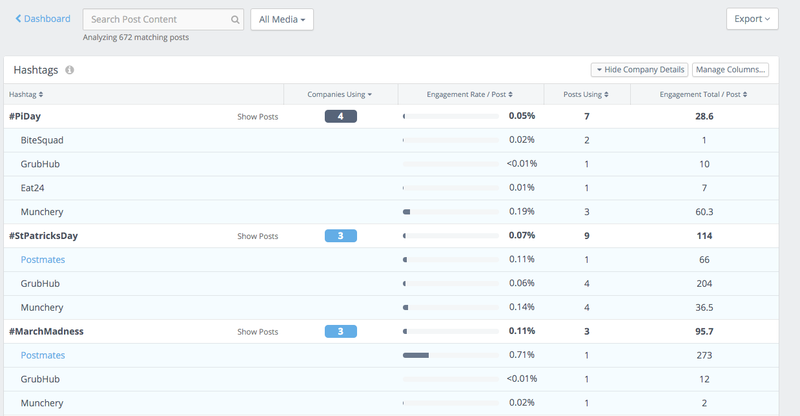 Rival IQ makes it easy to find out the most popular channel by activity and by engagement rate in the set of companies you're following, or for the search you completed. This allows you to compare your company to the other companies in the landscape. 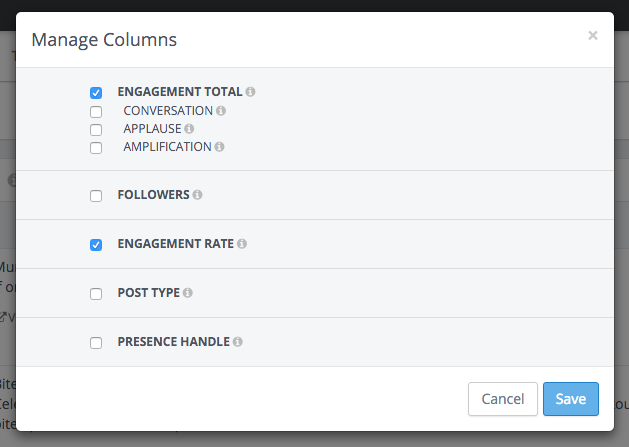 The Post Types widget shows you which types of posts get the most engagement in your landscape. The Post Times widget shows you which times companies in your landscape choose to post and their best times for engagement (based on the time of the post).